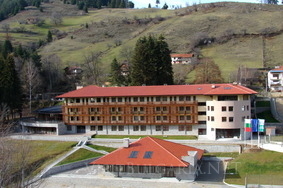 Borika hotel in Chepelare mountain ski resort near Pamporovo in Bulgaria. Book online. Location: Hotel Borika is wonderfully located on a hill in the city of Chepelare, only a kilometer away from the ski runs of Mechi Chal. The modern building of the four-star hotel is situated right next to a pine-tree forest and from it are revealed magnificent views of the city and the mountain. The guests of Hotel Borika will discover in it an oasis of tranquility and silence, where in an elegant environment they may pamper their body and soul, indulge in pure relaxation and well deserved rest. Accommodation: Hotel Borika offers a total of 118 beds in 48 double rooms, three apartments and eight maisonettes with luxury furnishing, elegant interior and numerous modern conveniences. For our business visitors we offer fully equipped conference room with 30 seats and a computer room with 10 seats and internet connection. Wireless Internet access is available in the hotel foyers. Wine & Dine: The restaurant of Hotel Borika with 100 seats enjoys a wonderful view of the mountain and offers an exceptionally peaceful and pleasant atmosphere. Our guests may taste selected dishes from the traditional Bulgarian cuisine as well as typical Rhodope delicacies. Entertainment: Those who are looking for more sophisticated ambiance for a peaceful break will find it in the hotel lobby bar, which serves a wide range of quality drinks. The main bar of Hotel Borika has the most up-to-date sound and light system, which will raise the spirits of those looking for a bit of fun. Sport and relax: Hotel Borika offers various opportunities for complete relaxation and quality rest in its modern sports center. The center has a professional fitness and massage facilities, an indoor swimming pool 22 m long and 15 m wide, a separate pool for children 6 m long and 3 m wide, two saunas, two steam baths, jacuzzi. There is also a large parking lot available for the hotel guests.